Build your Team with Teambuilding, Teambonding & Team Fun! Biking Singapore Teambuilding is a dedicated team of trainers, who focuses on introducing team bonding and team building activities for Corporate Organization, Government Institutes and Schools. Our teambuilding activities are built base on the benefits of Experiential Learning and Character development. Biking Singapore Teambuilding has developed a list of unique and creative use of bicycles to create the perfect team bonding training for your team. This ranges from a casual Fun Cycling Team Bonding session to a adrenaline rushing Amazing Race Cycling Teambuilding Or if you are looking at Philanthropic Teambuilding activities which allows you to work on team dynamics and return to society at the same time, try out our Build-A-Bicycle Team building ! Whether you are looking for a teambuilding program for your company or a leadership program for your class. Drop us an email on your objective and requirements for the team building session and we would be happy to customise the ideal program for you! Looking for a teambuilding event and want to give back to society? 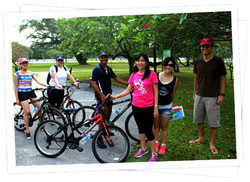 Biking Singapore brings to you our in house specialty, BUILD-A-BICYCLE Charity Teambuilding ! What better way than working with team members to out-do, out-sell and out-perform to create your very own bicycle and donate it to kids who long for their very own bicycle! Foodbank Rescue helps your team fill our Foodbank to the brim with much needed groceries and love to families who needs it most. Participants will see themselves on the stage of popular game shows; "Minute to Win it" and "Supermarket Sweep". To beat our Foodbank challenges, participants will need their wits and good knowledge of the grocery items! Through the challenges, teams will win as much items for their gift hamper to emerge as the winning team of the day. 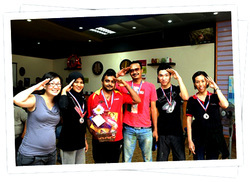 A teambuilding program where the reward goes not only to you but to others as well! Ride on the waters of the Singapore River on the River Boat and have your teambuilding along the River! Teambuilding has never been this fun! 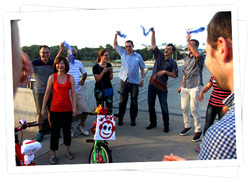 Our team has prepared a series of team bonding challenges for you and your colleagues. Take lead and venture the different quays. Enjoy fun and exciting challenges, which would surely create that bonding spark needed for your office! Compete between teams of colleagues and challenge your team's teamwork in team bonding station games. The Biking Singapore Amazing Race can be conducted in locations such as East Coast Park, Sentosa and Pulau Ubin. Perfect for Leadership Training, Teambuilding and Communication Enhancement. Enjoy a casual cycling session with your colleagues with various routes to select base on your preference! From a scenic City Cycling Route, a rustic adventure Pulau Ubin Route to a historic Changi Coastal Route Cycling Route. The ideal Teambonding experience with communication opportunities, team identity emphasis and a day out of the office experience! When was the last time you picked up a brush and painted a canvas when you where a child? Revisit your artistic flare as we introduce to you a sophisticated Art Jamming Session ideal for both artistically and non-artistically incline individuals! Build your team through an event of sophistication and creativity with us! You will get exclusive use of the Art Jamming Studio for 3hrs and provided supplies of professional painting equipments. Bask in the serenity of the studio with soothing melodies and a complimentary drink to get your creative mind working. The team needs a relaxing and fun day out off the office? Art Jamming Teambonding is the perfect candidate for the job!